One of the things I love most about studying ancient Egypt is that although mummies and pyramids make the Egyptians seem exotic, the more you learn about them, the more that you see that they were just ordinary people with more similarities to us today than you might imagine. There are certain basic, innate human impulses shared by all of humanity- and gaming is one of them. Although games have often been viewed rather dismissively in scholarship, their importance to society and culture is undeniable. In fact, humanity created games long before other more â€˜practicalâ€™ ancient inventions such as pottery, writing, or the wheel. This past weekend, I attended an event in London on board games and said a few words about ancient Egyptian games that I thought would be nice to share here as well. It was quite amazing to get people there playing the board game Senet, which was created in Egypt 5000 years ago! (Another post will follow this about the actual experience of playing Senet and how the game play may relate to Egyptian conceptions of society). Even more incredible though is that there are much older games in existence. They are one of the oldest human creations, dating back 8000 years ago. The earliest evidence for board games in the world comes from the Neolithic Near East, dating to around 6000BCE onwards. Archaeologists in the Levant and Iran have discovered 12 possible gaming boards made of either limestone or plaster with lines of holes or hollows as well as possible gaming pieces (Simpson 2007). Irving Finkel (2007) discusses the conditions and motivations surrounding the emergence of board games: â€˜from the context of their discovery, it is evident that their appearance on the stage of human social evolution coincides with the development of structured and sedentary communal living, associated with shared responsibility and labour. It is under these circumstances that leisure first makes itself apparent, and it is surely leisure that is the prime requirement for the invention and play of board games. In India, there is a prime and eloquent word for this, namely â€œtime-passâ€. It has probably always been largely time-pass that has governed the role of board games in the worldâ€™. Games, like life, combine both skill and chance, and they embody a number of primal human preoccupations: survival, competition, the battle, the hunt, the race, social organisation, and counting. A variety of different board games were played in ancient Egypt (others which are not discussed here are Twenty-Squares, originally Mesopotamian in origin, the marble game, and Men â€˜enduranceâ€™). Hounds and jackals was a 2-player race game with a shield-shaped board divided into two tracks, one for each player. Each side had had 29 holes, an outer row of 19 and an inner row of 10, with a shared 30th hole in the middle that marked the finish. The playing pegs were long pointed pieces that could be inserted into the holes; 5 had the heads of jackals, and the other 5 had the heads of dogs. Each player would race their 5 pegs to the finish. To make things more interesting, lines drawn connecting holes 6 and 20 and holes 8 and 10 served as either shortcuts or setbacks depending on which end you landed on, and the hieroglyph sign for good marked at holes 15 and 25 may have indicated an extra turn. The game may have been invented around 2100BCE and it spread throughout the Near East (for more information see Hoerth 2007). One of the earliest games in ancient Egypt is known as Mehen, or the serpent game. Mehen was played on a circular board in the form of a coiled snake with the head at the centre and the body divided into squares. Itâ€™s the only known multi-player game and representations depict it being played with 6 lion-shaped gaming pieces and 6 marbles. Unfortunately, how these were used is still uncertain. Captions from tomb scenes showing the game being played suggest that it involved the use of strategy, and that part of the game was to capture something, perhaps the opponent’s pieces (for more information see Piccione 1990b; RothÃ¶hler 1999; Kendall 2007). The game called Senet, which means â€˜passingâ€™, was the most popular game in Egypt. It was played for over 3000 years and a possible derivation of the game survived into 19th century Egypt in the form of the game known as al-tab al-sigah. Senet is also comparable to backgammon in game play. Although there is no recorded set of rules for the game, examination of the 120 examples of game boards that survive, the many representations of the game being played, and various texts that describe it being played, has allowed the reconstruction of the game play. The game was two-player and essentially a race, each player moving a team of 5 draughtsmen (originally 7 before the New Kingdom) across a board of 30 squares arranged into three parallel rows of ten squares. The objective was to be the first player to move all of their playing pieces off the board. Players could pass and block their opponentsâ€™ pieces and possibly even capture them and sent them back to restart from the beginning of mid-point of the board. Dice-like casting instruments- either 4 casting sticks or 2 knucklebones- were used to determine the number of moves. The casting sticks were semi-cylindrical – one side was flat and painted white, while the other side was rounded, dark coloured, and incised with lines.The sticks were probably used in a similar to the manner in which they were used in modern Egypt as late as the 19th century: The 4 sticks were thrown together and counting number of white or flat sides facing up gave the number of moves. If all of the sticks ended up laying face down, ie. with black, curved side facing up, it counted as 5. Senet was played by both the rich and the poor. Even though who were less well-off would scratch graffito boards into the ground or onto slabs of stone or broken pottery. We even have a few examples where bored priests scratched the game into the walls of ancient temples! On graffito boards, pebbles or chips of broken pottery would have been used as playing pieces. Formal playing pieces were initially all conical in shape, differentiated with colour and one set being taller than the other, but they evolved into all sorts of different shapes, like animal heads. 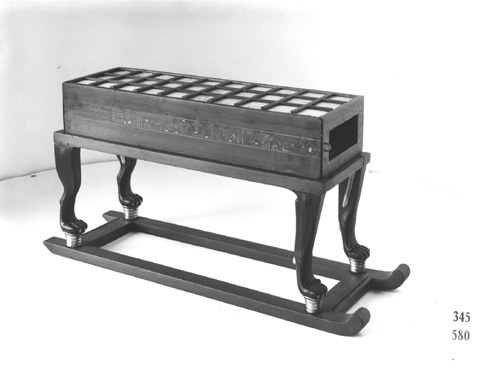 More elaborate boards owned by the rich would often have Senet on one side of the board, and a game known as Twenty-Squares that travelled to Egypt from Mesopotamia on the reverse side. The narrow sides of the board had drawers containing the playing equipment. Tutankhamun was buried with 4 senet boards in his tomb. Senet was not simply a matter of luck because the number of moves thrown with the sticks could be apportioned among the pieces as the player saw fit. For example, if a player rolled a 4, they could choose to move one of their pieces forward four spaces and another piece just one space. Certain squares on the board offered advantages or pitfalls. Sometimes these were indicated by symbols inscribed on the squares, though often they were left blank and just understood, or only inscribed the most important squares. From the last 3 squares, the players had to throw the exact number needed to move off the board. Strategy could be used to avoid dangerous squares or block an opponent pieces from progressing. Moving pieces together in groups protected them from being taken by oneâ€™s opponent. Senet was incredibly popular form of entertainment: a representation of senet in the New Kingdom Theban tomb of Nefer-renpet is accompanied by the inscription: â€œYou sit in the hall; you play Senet; you have wine; you have beerâ€ (Decker 1992, 124; Pusch 1979, 87, pl. 24.b). Even as a form of leisure, it wasnâ€™t without intense competition and rivalry. 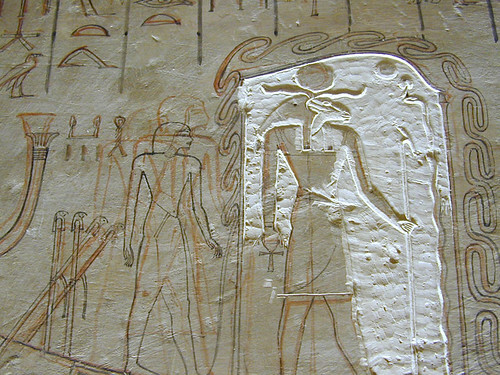 Many other depictions show players exchanging Â taunts and insults: in the Old Kingdom tomb of Pepi-ankh at Meir (approx. 2300 BCE), one player says: â€˜Be happy my heart, for I shall cause you to see it [your piece] taken away!â€™. His opponent responds: â€˜You speak as one weak of tongue, for senet is mine!â€™. Initially Senet was an abstract game and purely secular, however Egyptian culture and their beliefs and fears influenced the game over time so that it developed an accompanying narrative, a story that gave it meaning. Today, most new games are fleshed out from their basic game mechanic with themes and ideas that are meaningful to us, our culture and history, our desires and fears. Similarly to Richard Parkinsonâ€™s argument for Egyptian literature offering a permissive context for subversive discourse (e.g. Parkinson 2002, 98-107), games can offer a safe place in which to confront fears and concerns. Even today this is true, for example, numerous modern games draw on the current war in Afghanistan, while the game â€˜Flowerâ€™ presents a world ravaged by environmental disaster, and the online game â€˜Smokescreenâ€™ addresses the potential dangers and privacy issues inherent in social media. For the ancient Egyptians, back in a time when life expectancy was around 30-36 (Nunn 1996, 22; Meskell 2002, 13), death was their greatest fear and their greatest hope was survival for eternity in an idyllic afterlife. The struggles in the game of Senet began to be associated with the dangers of the journey to the afterlife and the game integrated key narratives of Egyptian religion, telling the story of the struggles of the sun god Ra traversing the underworld by boat each night and fighting off an array of deities, demons, and obstacles. Various elements of game play- certain moves and squares- became associated with specific actions and events in these stories. This change is very understandable, as in ancient Egypt there was no division between secular life and religion: almost everything was imbued with religious belief. By the Eighteenth Dynasty, the board had been transformed a simulation of the netherworld with itâ€™s squares depicting major divinities and events in the afterlife. Originally in the Old and Middle Kingdom, the last 5 squares of the board had the straightforward and practical meaning of good, bad, three, two, and one, the numbers indicating the exact throw of the sticks youâ€™d need to exit the board. Later on, they developed a more mystical significance and the three numbers were instead usually indicated with a group of three gods or three bas, two gods, and a single figure of the sun god. The first square in the upper left-hand corner was called the â€˜House of Thothâ€™ since this ibis-headed scribal god held the role of announcing the deceased in the court of judgement. Square 15 at the middle of the board was called the â€˜House of Repeating Lifeâ€™ and was often decorated with the image of a frog, an Egyptian symbol of resurrection. Square 16, the House of Netting, entrapped the player so they missed a turn. Square 27, the Field of Water, could drown the piece that landed there and send it back to square 15 to be Â â€˜rebornâ€™. The image of the sun god on the final square signified rebirth with the sun god, and whoever moved all of the pieces off the board first would supposedly take his place with the gods. The story attached to the game enriched it, taking it from simply a form of entertainment and competition, to a meaningful experience: a journey with a sense of urgency and danger. 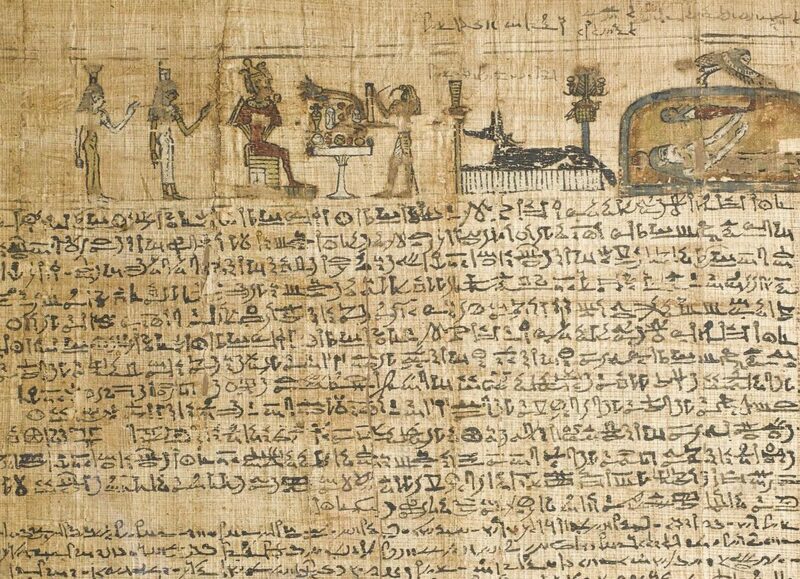 But not only did religion influence the narrative of the game, it actually became part of Egyptian religious beliefs and texts, such as the Book of the Dead, as one of the challenges the deceased could face in his journey to the afterlife. Earlier in Egyptian history, tomb scenes had depicted the tomb owner playing the game with another person, or watching two other people play, purely as a form of entertainment, but when the game became associated with the idea of resurrection and the struggle to reach the afterlife, tomb scenes began to show the deceased playing an invisible opponent as a means to entering the afterlife. [so that I may become a god, as the thirty-first] (god). and I will deliver] his draughtsmen (to him). that <his> draughtsmen might turn backward <on him>. so that he does not know his response. while my opponent is stopped in the [House of] Netting, which humbles him (holds him back) by means of the meshesâ€™ (Piccione 1990a, 123-38). This religious association of senet with the afterlife may have been initially born out of the Middle Kingdom concept that living persons could bridge the gap between themselves and their deceased family by playing senet with them. Coffin Text Spell 405 states: â€˜Let him play senet with those who are on earth. It is his voice which is heard, (although) he cannot be seenâ€™ (Piccione 1990a, 84). Graffito senet boards have been found scratched into the floors of tomb chapels, possibly as part of a ritual, which could have been conducted during the Beautiful Festival of the Valley, when Egyptians visited the tombs of their ancestors. However, it wasnâ€™t just the game of senet that changed in response to Egyptian religion, the games themselves influenced Egyptian life and culture in a myriad of ways. For example, the snake game Mehen influenced religious beliefs long after it stopped being played at the end of the Old Kingdom. In New Kingdom religion, the snake of the board game became a god. Mehen was an immense coiled serpent who encompassed the sun god Ra in his many coils, protecting him and guiding the passage of the sunâ€™s boat through the netherworld each night to be reborn again each dawn. His board game origins seem to have been carried over in the role he took on as the patron protector god of senet players trying to enter the Afterlife. In the Coffin Texts, this dangerous path was called the â€˜roads of Mehenâ€™ (Piccione 1990b). Games, especially senet, also formed a rich part of Egyptian culture, featuring in their writing system, literature, and art. The image of the senet board was used as an important hieroglyphic symbol from the very invention of writing, standing for the phonetic sound â€˜mnâ€™. Games feature frequently in art, but not just within tombs, for example the Satirical Papyrus, which shows a lion and an antelope engaging in a (friendly or competitive?) game of Senet. A demotic tale from the third century BCE tells the story of Setne Khamwas, who breaks into the tomb of the prince and magician Nineferkaptah to acquire the magical â€˜Book of Thothâ€™. There, Setne is challenged by the ghost of the magician to play senet for possession of the book. Setne is beaten three times and after each loss, the ghost beats him over the head with the game box, driving him into the earth. Setne only manages to escape when outside help arrives. As Peter Piccione (1994) has pointed out, here senet once again become associated with rebirth from near-burial, and the supposed protection of the text by a coiled serpent is another reference to Mehen, the snake game/god. Most people would acknowledge that games can reflect important cultural concepts but the impact they can have on a wider cultural sphere, enriching creativity and even influencing our view of the world, shouldnâ€™t be underestimated, diminished, or disparaged. Ancient Egyptian games teach us that gaming is a universal aspect of humanity: a reflection of who we are, a means of expressing our desires and fears and enacting basic human impulses, and most of all, good fun. References are listed below, as well as links to where you can play senet online, buy your own board, or find more information. Credit for the research that made this post possible goes especially to Peter Piccione, as well as Edgar Pusch, John Tait, Wolfgang Decker, and Irving Finkel, the organizer of the first colloquium of ancient board games. Ahern, Emily Martin 1982. Rules in oracles and games Man 17: 302â€“12. Decker, Wolfgang 1992. Sports and games of ancient Egypt (trans.) Allen Guttmann. Sport and History Series. New Haven and London: Yale University Press. Finkel, I. L. 2007. Ancient Board Games in Perspective: Papers from the 1990 British Museum colloquium with additional contributions. London: British Museum Press. Hoerth, A.J. 2007. The Game of Hounds and Jackals. In I. L. Finkel (ed), Ancient Board Games in Perspective: Papers from the 1990 British Museum colloquium with additional contributions. London: British Museum, 64-8. Kendall, Timothy 2007. 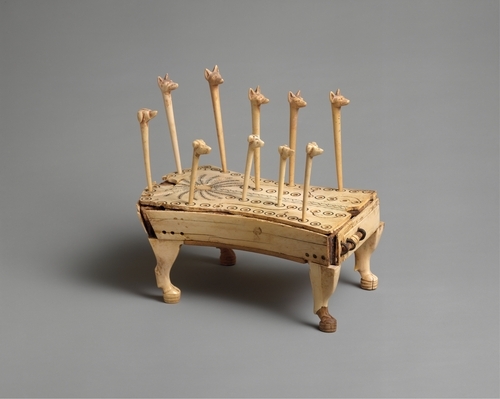 Mehen: The Ancient Egyptian Game of the Serpent. In I. L. Finkel (ed), Ancient Board Games in Perspective: Papers from the 1990 British Museum colloquium with additional contributions. London: British Museum Press, 33-45. Meskell, Lynn 2002. Private life in New Kingdom Egypt. Princeton: Princeton University Press. Murray, H. J. R. 1952. A history of board games other than chess. Oxford: Clarendon Press. Nunn 1996. Ancient Egyptian Medicine. Norman: University of Oklahoma Press. â€” 2002. Poetry and culture in Middle Kingdom Egypt: a dark side to perfection. Egyptology and Ancient Near Eastern Studies. London and New York: Continuum. Piccione, Peter A. 1980. In Search of the Meaning of Senet. Archaeology 33: 55-8.
â€” 1990a. The Historical Development of the Game of Senet and its Significance for Egyptian Religion: University of Chicago. â€” 1990b. Mehen, Mysteries, and Resurrection from the Coiled Serpent. Journal of the American Research Center in Egypt 27: 43-52.
â€” 1994. The Gaming Episode in the Tale of Setne Khamwas as Religious Metaphor. In David P. Silverman (ed), For His Ka: Essays Offered in Memory of Klaus Baer. Chicago: Unversity of Chicago, 197-204.
â€” 2007. The Egyptian Game of Senet and the Migration of the Soul. In I. L. Finkel (ed), Ancient Board Games in Perspective: Papers from the 1990 British Museum colloquium with additional contributions. London: British Museum Press, 54-63. Pusch, E.B. 1979. Das Senet-Brettspiel im Alten Ã„gypten. Munich. â€” 2007. The Egyptian “Game of Twenty Squares”: Is it Related to “Marbles” and the Game of the Snake. In I. L. Finkel (ed), Ancient Board Games in Perspective: Papers from the 1990 British Museum colloquium with additional contributions. London: British Museum Press, 69-86. RothÃ¶hler, Benedikt 1999. Mehen, God of the Boardgames. Board Game Studies 2: 10-23. Simpson, St John 2007. Homo Ludens: The Earliest Board Games in the Near East. In I. L. Finkel (ed), Ancient Board Games in Perspective: Papers from the 1990 British Museum colloquium with additional contributions. London: British Museum Press, 5-10. Tait, W. J. 1982. Game-boxes and accessories from the tomb of Tutankhamun. Tutankhamun’s Tomb Series 7. Oxford: Griffith Institute. â€” 1998. Dicing with the gods. In Willy Clarysse, Antoon Schoors, and Harco Willems (eds), Egyptian religion, the last thousand years: studies dedicated to the memory of Jan Quaegebeur. Leuven: Peeters, 257â€“64. â€” 2007. Were there Gamesters in Pharaonic Egypt? In I. L. Finkel (ed), Ancient Board Games in Perspective: Papers from the 1990 British Museum colloquium with additional contributions. London: British Museum Press, 46-53. Tyldesley, Joyce 2007. Egyptian Games and Sports. Princes Risborough: Shire. One of the things I love most about studying ancient Egypt is that although mummies and pyramids make the Egyptians seem exotic, the more you learn about them, the more that you see that they were just ordinary people with more similarities to us today than you might imagine. There are certain basic, innate human impulses shared by all of humanity- and gaming is one of them. Although games have often been viewed rather dismissively in scholarship, their importance to society and culture is undeniable. In fact, humanity created games long before other more â€˜practicalâ€™ ancient inventions such as pottery, writing, or the wheel! This past weekend, I attended an unconference in London on board games and said a few words about ancient Egyptian games that I thought would be nice to share here as well. It was quite amazing to get people there playing the board game Senet, which was created in Egypt 5000 years ago! (Another post will follow this soon about the actual experience of playing Senet and how the game play may relate to Egyptian conceptions of society). Hounds and jackals was a 2-player race game with a shield-shaped board divided into two tracks, one for each player. Each side had had 29 holes, an outer row of 19 and an inner row of 10, with a shared 30th hole in the middle that marked the finish. The playing pegs were long pointed pieces that could be inserted into the holes; 5 had the heads of jackals, and the other 5 had the heads of dogs. Each player would race their 5 pegs to the finish. To make things more interesting, lines drawn connecting holes 6 and 20 and holes 8 and 10 served as either shortcuts or setbacks depending on which end you landed on, and the hieroglyph sign for good marked at holes 15 and 25 may have indicated an extra turn. The game may have been invented around 2100BCE and it spread throughout the Near East (for more information on Hounds & Jackals see Hoerth 2007). One of the earliest games in ancient Egypt is known as Mehen, or the serpent game. Mehen was played on a circular board in the form of a coiled snake with the head at the centre and the body divided into squares. Itâ€™s the only known multi-player game and representations depict it being played with 6 lion-shaped gaming pieces and 6 marbles. Unfortunately, how these were used is still uncertain. Captions from tomb scenes showing the game being played suggest that it involved the use of strategy, and that part of the game was to capture something, perhaps the opponent’s pieces (for more information on Mehen see Piccione 1990b; RothÃ¶hler 1999; Kendall 2007). The game called Senet, which means â€˜passingâ€™, was the most popular game in Egypt. It was played for over 3000 years (from the First Dynasty around 3000BCE until the 1st century CE) and a possible derivation of the game survived into 19th century Egypt in the form of the game known as al-tab al-sigah. Senet is also comparable to backgammon in game play. Although there is no recorded set of rules for the game, examination of the 120 examples of game boards that survive, the many representations of the game being played, and various texts that describe it being played, has allowed the reconstruction of the game play. Senet was played by both the rich and the poor. Even though who were less well-off would scratch graffito boards into the ground or onto slabs of stone or broken pottery. We even have a few examples where bored priests scratched the game into the floors of temples! On graffito boards, pebbles or chips of broken pottery would have been used as playing pieces. Formal playing pieces were initially all conical in shape, differentiated with colour and one set being taller than the other, but they evolved into all sorts of different shapes, like animal heads. while my opponent is stopped in the [House of] Netting, which humbles him (holds him back) by means of the meshes” (Piccione 1990a, 123-38). Games can reflect important cultural concepts and the impact they can have on a wider cultural sphere, enriching creativity and even influencing our view of the world, shouldnâ€™t be underestimated, diminished, or disparaged as often is the case today. Ancient Egyptian games teach us that gaming is a universal aspect of humanity: a reflection of who we are, a means of expressing our desires and fears and enacting basic human impulses, and most of all, good fun. â€” 1990a. The Historical Development of the Game of Senet and its Significance for Egyptian Religion, Ph.D. thesis. University of Chicago. Rollefson, Gary O., A Neolithic Game Board from Ain Ghazal, Jordan, Bulletin of the American Schools of Oriental Research 286 (May, 1992), 1â€“5.